The Lady Clarets started the new year with a welcome 5-2 win against City of Manchester Ladies. In the early stages, the Clarets pressed the City of Manchester defence. Linny Craig swept down the left and found Joanna Rohman, who struck a left-foot shot from distance that lifted high over the bar. Holly Hunter, on a forward run, shot from an angle but the keeper caught the ball from up high, and star player Craig tested the keeper with a shot from the left which was well saved. Manchester created the first threat against the Clarets on 11 minutes when a ball driven into the box was smothered by the Clarets stopper Leanne Ashton-Smith. Her long kick up field was collected by a Manchester player, but pressure from Craig and Rebecca Hayton resulted in a loose ball that was driven at goal by Craig, deflecting in off a defender. The Clarets were dominant, and Hunter hit the post on another forward run, before Justine Wallace shot from an angle and had the ball deflected into the side netting. From the corner, Lizzy Hamer collected a clearance outside the area and drove the ball into the bottom corner of the goal. At 2-0 down, Manchester responded with an attack that stretched the Clarets defence. Both Taylor Gregson and captain Jo Holt made sliding tackles but Manchester pushed forward and forced a high save from Ashton-Smith. The Clarets pushed forward though Kim Sykes and Emma White and they provided chances for Justine Wallace and Hayton, who both skimmed the woodwork. Manchester replied with two raids on the Clarets’ goal, where Ashton-Smith had to advance quickly to block. The Clarets were fortunate not to concede a penalty when a striker was felled just before half-time. In the second half, the Lady Clarets were quickly on the attack. A cross from Wallace was met at the far post by Hamer, who shot narrowly wide. Moments later Hamer passed forward to Wallace, who placed the ball wide of the keeper to make it 3 -0. City of Manchester introduced a new player who helped them lift the game and equal the Clarets for possession. The Clarets countered through a ball by Rohman, who set Craig off on a run, and she picked out Wallace, who found Hamer, who finished to put the Clarets 4-0 up. However, from the restart a long pass picked out the Manchester substitute who shot from distance over the head of Ashton-Smith to pull one back. And it was 4-2 as a Clarets attack broke down and a Manchester striker turned the defence and scooped the ball into the net. 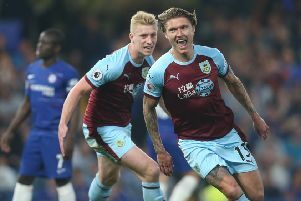 The final Clarets goal came on a breakaway where Hamer tore down the wing and delivered a cross which was met by Hayton, who slotted the ball into the corner of the net. On Sunday, the Lady Clarets are in action at Barden against Manchester Stingers, at 2 p.m.